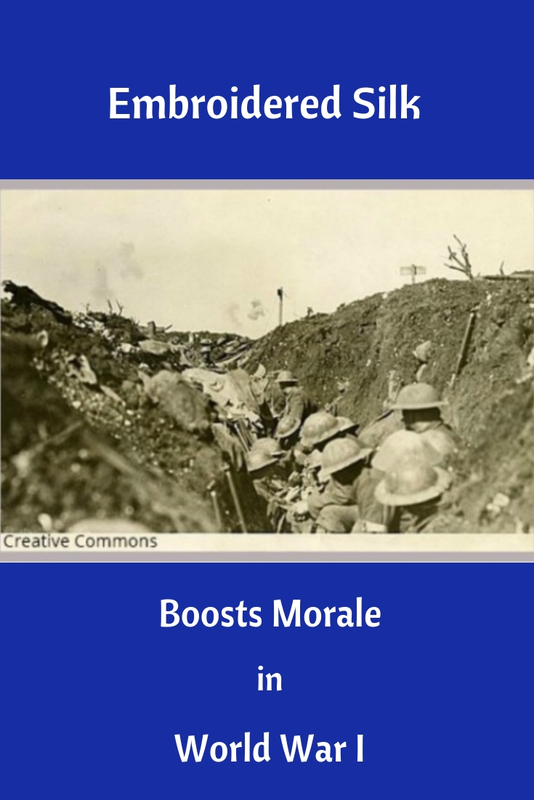 Imagine fighting for your life in a muddy 8 to 10-foot-deep trench. Rats the size of kittens are running around you. Lice are all over your body. You fear you will succumb to trench mouth, trench foot (fungal infections) or lose your feet to frost bite in the winter. Grenades are blowing up around you. Fire from machine guns and flame throwers are bombarding you, not to mention that you have to keep a gas mask at the ready to protect you from poison gas attacks. This was life in the trenches along the European Western Front in World War I (1914-1918). How did soldiers keep fighting in these horrible conditions? 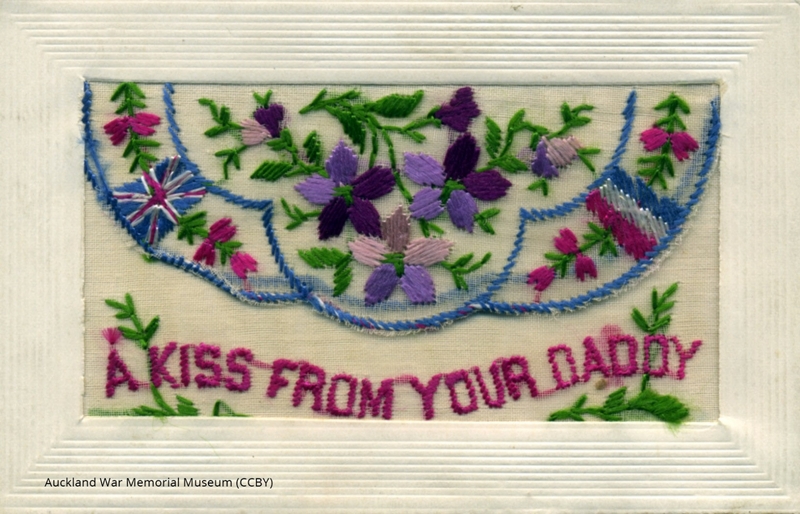 They kept in touch with loved ones back home by sending special embroidered silk postcards. In this post, I will tell you more about them and show you some examples that have survived the past 100 years. 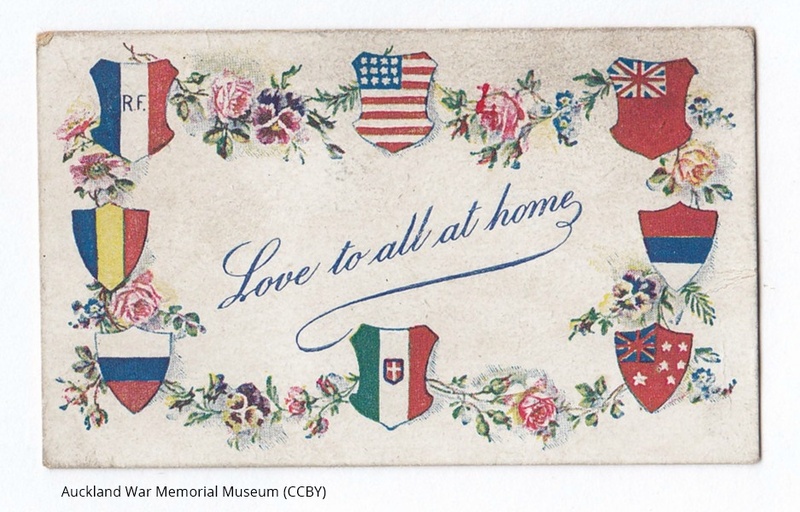 Soldiers on the Western Front of the war purchased these souvenir postcards to send back home. 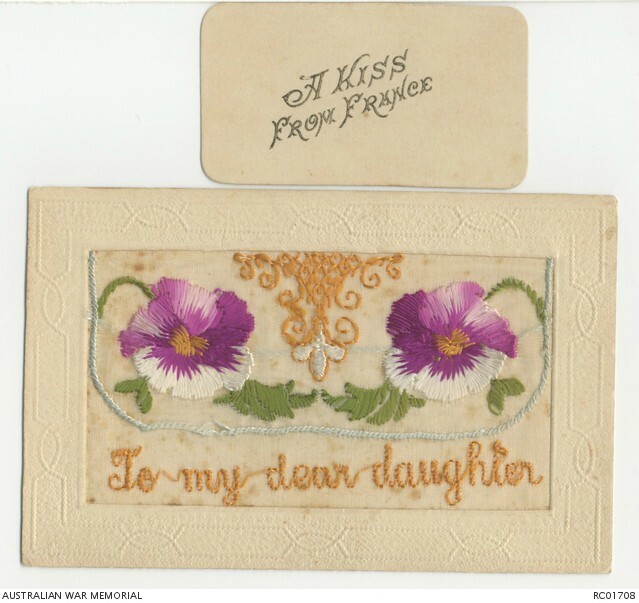 The cards were made by French and Belgian women who worked from home or in refugee camps. The women hand embroidered different designs on strips of silk mesh. Often times as many as 25 designs would be stitched on the silk mesh strip. There were two styles of cards. 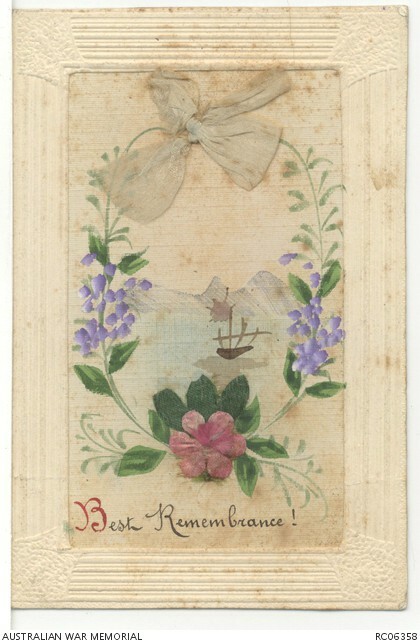 One style had one piece of silk applied to a post card. The other style used two pieces of silk sewn together to create a pocket. A note or silk handkerchief could be slipped into the pocket. 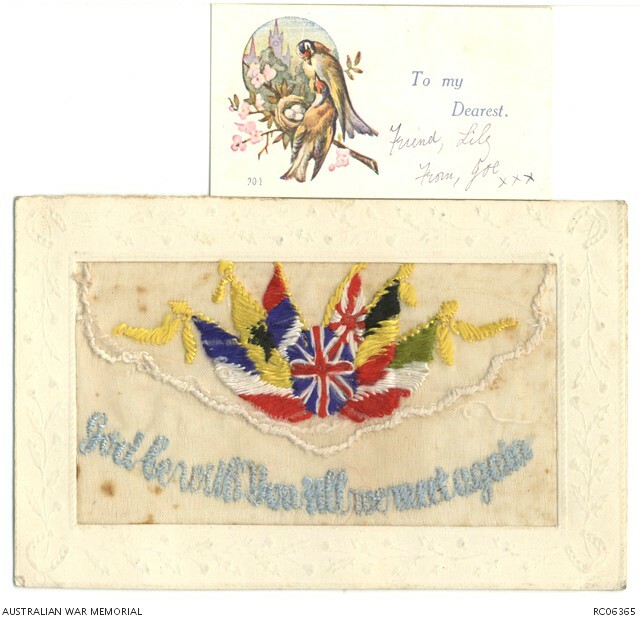 The finished silks were then sent to factories where they were cut and mounted on post cards. While many postcards no longer exist, museums and private collectors have many. Here are some websites that have wonderful examples you will want to see. The cards have a variety of themes. Some are greetings or endearments to family. Others feature locations in the war. Of course, many cards are holiday greeting cards for Christmas or the New Year. They also feature symbols of the Triple Entente (alliance of Great Britain, France, Russia, Belgium, and Australia). Family and the hope of seeing family again one day kept soldiers going. The first four examples include the card that would have been slipped into the postcard. Notice the needlepainting in some of the flowers. The colors and sentiment in "A Kiss From Your Daddy" is a special one. Many cards featured patriotic and war themes. I think the inclusion of canons and reference to trenches is interesting. 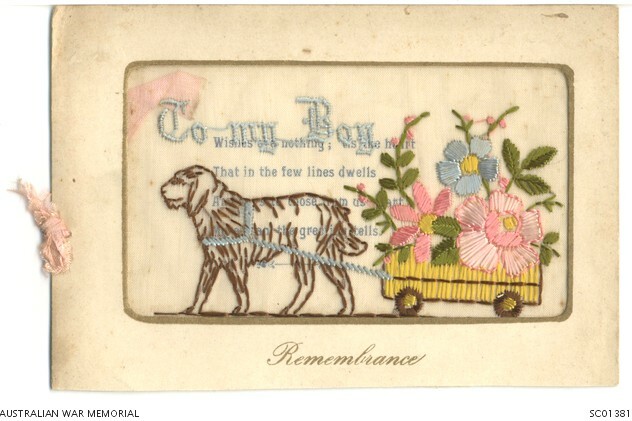 These cards feature the locations where soldiers were fighting. Of course, holidays greetings were very popular souvenirs. There are many aspects of these World War 1 Silks that amaze me. As a needle artist, I admire the hand stitching that went into the work - satin stitches, long and short stitches for shading, and the attention to detail. I also appreciate the challenge of stitching on silk gauze. It must have been tedious. 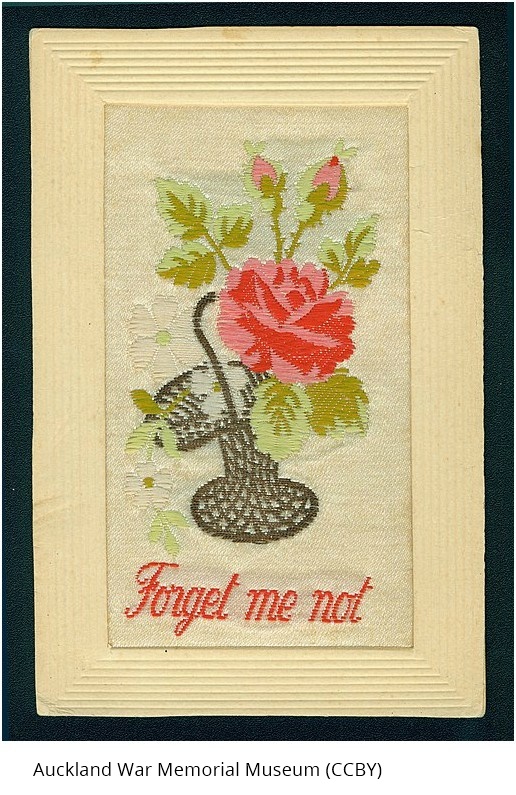 Most of all it still amazes me that in the midst of the hardships and brutality of war, needlework not only provided much needed wages for the homefront but it brought solace and comfort to those who sent and received them. What treasures! I encourage you to see other examples by clicking on the links in this post. Is there a postcard you particularly like and what about it makes it a favorite? 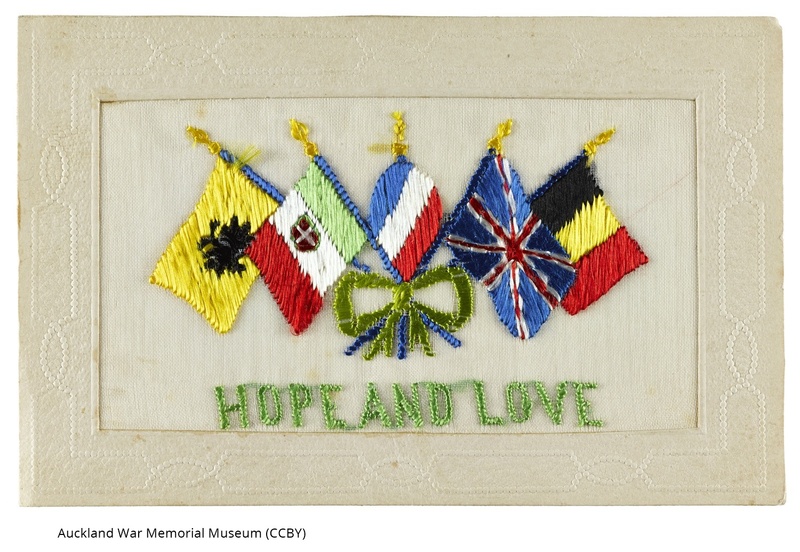 Do you have special souvenirs from loved ones who have been to war? Tell us about it in the comments below.